It has been a while since I was at the Katonah Museum of Art and it worked out that I was enroute home from Queens and was able to make it to their opening reception. 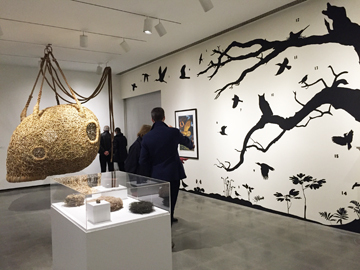 This exhibition, “The Nest an exhibit of art in nature” does in fact, as the pr indicates, examine the beauty and symbolism of nests in art and nature. 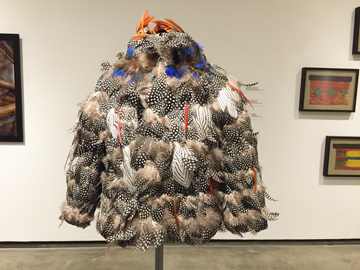 Curated by Elizabeth Rooklidge, the exhibit includes relics from birds nests made by pre-columbian cultures, nests from the collection at the Peabody Museum of Natural History and artworks by 18 invited artists. The show will run thru June 19. 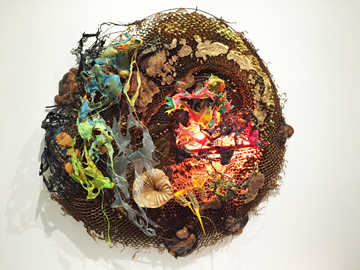 According to the museum’s press release: “Drawing its inspiration from the extraordinary form of the bird’s nest, the exhibition examines how the fundamental drive to gather, assemble, and create is a function of both nature and the artistic process and examines the exquisite beauty and profound symbolism of the nest in art and culture.” and they have accomplished their aim. One of my favorite nests was a hanging basket made by Porky Hefer called “Nest Sculpture” large enough for 2 people to spend time in it swinging, enjoying a meal, reading or whatever. It is made of Jute, metal framing and woven cane and can be seen in the photograph above that also has James Prosek’s murals. Artists in the exhibition include Sharon Beals, Sanford Biggers, Dove Bradshaw, Björn Braun, John Burtle, Walton Ford, Shiela Hale, Fiona Hall, Porky Hefer, Nina Katchadourian, Louise Lawler, Judy Pfaff, James Prosek, Hunt Slonem, Kiki Smith, Andreas Sterzing, Paul Villinski, and David Wojnarowicz. The museum has an extensive education program and one, Nest Here, is specific to this exhibit (as are several other related programs). Families will explore what a nest means as they create their own nest or birdhouse.